As we observe Nature, we notice that certain patterns are repeated. Permaculture learns from these patterns and uses them to help solve problems in our environment, our homes and our lives. Trees grow in a branching pattern that repeats itself into its twigs and the veins of its leaves, and downward into its roots. Rivers flow from tiny streams into ever larger bodies until they find the sea. Humans transport water and gas through branching pipelines. Water moves in waves and ripples. As does sound. As do squirrels squiggling across the grass in my garden. We make zig-zags as we walk (as you can see in the video below). Spirals are everywhere. Some plants grow leaves in a spiral around the stem. Pine cones are made out of spirals. So are snail shells. Heating elements are man made spirals. In my Permaculture Design course, we were asked to think about the functions of these patterns and give some examples of where they were used in the man made world. I had serious trouble with this. The patterns are obvious enough. But why is a spiral a useful thing for a snail or a pine cone? And why do screws have spirals? How do you express that in words? I got a bit lost. Mind you, there is one natural pattern that permeates Druidry on every level. You can see it when you drop a pebble into a pond. Or in the growth rings of trees. And in the dance of the Earth around the Sun. A Druid sees and makes circles everywhere. The circle the Earth makes around the Sun of course gives us the seasons, which Druids mark with eight seasonal Festivals. This ritual year gives us reasons to get together and form community. 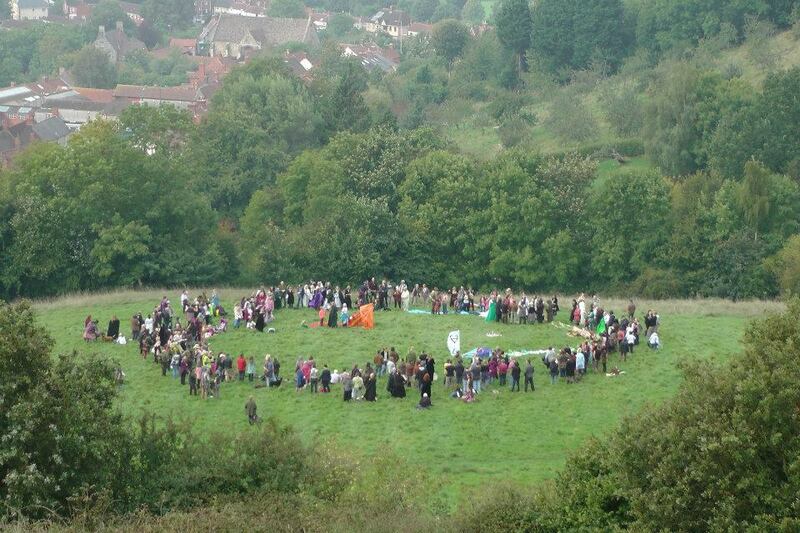 And when we do, we hold our ceremonies in circles. In fact, we like to do almost anything in circles, from businesslike community meetings to sitting around a fire to tell stories. At the beginning of OBOD rituals we state that ‘We gather as equals, in our physical form upon the Earth. Each presence is a blessing, and with every breath we take, we breathe light and life into this circle’. Circles give us a sense of equality and harmony. Practically speaking, it means we can all see each other as we talk through an issue. Given all this, it comes as a surprise that I have such difficulty recognising other patterns in the world around me. Maybe it’s because I haven’t ever looked at things with patterns in mind. When I’m out in Nature, I like to look at tiny details rather than the bigger picture. I’ve learned how to see differences so I can tell an ash tree from an oak, and plantain from dandelion. I guess I’ll just have to give myself some time to practise looking for the repeating patterns and commonalities. Looking around the internet for inspiration and a bit of help with pattern recognition, I found this video. It gives a lot of examples of where patterns can be found. But most of all, it showed me that I can learn from and find inspiration in more than just circles. Image by Alexander Tingle, taken at The Warrior’s Call inaugural ritual 2013.